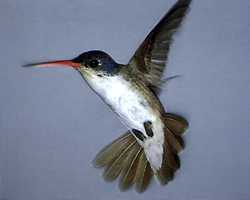 Average weight: male 5.78 g, female 5.19 g.
Adult male: Emerald green back, violet-blue crown, unmarked white breast and throat, red bill with dark tip. Adult female: Almost identical to male, but crown is slightly less brilliant. Observed in Arizona, California, New Mexico, and Texas. Winters in Mexico. 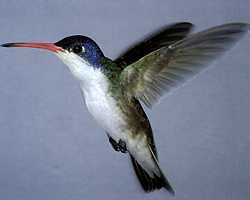 For more information, see the USGS species account.